Clio, Mich – PAWS Workholding will debut its new 3J Collet Clamping System at IMTS – The International Manufacturing Technology Show 2014 being held at Chicago’s McCormick Place Sept. 8-13. PAWS Workholding can be found in the Tooling/Workholding Pavilion, Booth # W-2138, which is located in the West Building. Ideal for OEMs and production machining operations, the PAWS 3J Collet Clamping System provides automated concentric clamping of eight parts up to 1 ¾ inches in diameter on the O.D. The PAWS 3J System delivers repeatability and increased rigidity when machining round parts. Additionally, the system provides dead length stop capabilities to allow accurate control of part Z height dimensions during machining. PAWS Workholding has been providing clamping and fixturing solutions to the manufacturing community since the early 1990’s. The company’s staff of dedicated, knowledgeable engineers and designers develop first class solution to help customers achieve manufacturing output goals. As the originator of the patented hydraulic clamping system, the PAWS team understands the importance of efficiency and productivity in a production milling environment. Sometimes a single significant event can be enough to give a business a new perspective and jumpstart it toward high achievement. Some companies are able to capitalize on such events by following them up with more creative solutions. For 20-plus years, Scott Archery was set on cruise control, content with its slow, steady growth. But when The Outdoor Group, LLC, purchased the company in 2012, higher expectations became the norm. Through some creative work on the shop floor, along with a series of other business acquisitions, the company has been able to briskly expand and shows no signs of slowing. The company was founded more than 25 years ago in the garage of Bill Scott. The company’s core product is a line of releases for use in archery shooting. Working on a manual mill, Mr. Scott was able to produce about 20 parts a day. By 1995, as demand continued to increase, the company had moved into its current facility in Clay City, Kentucky, adding a couple of Fadal mills and a single Citizen Swiss lathe. Production was steadily ramping up, and within a few more years, the company was producing about 35,000 parts per year. But things were only starting to get interesting. The company was experiencing steady growth, so it was easy to accept the status quo and continue with little change. But much potential was going untapped. Finally in 2008, company management became more aggressive and purchased Custom Bow Equipment (CBE), a manufacturer of high quality target sights. To support this move, the company also expanded its CNC machining equipment and staff to broaden the CBE brand name and designs and to strengthen its overall position in the market. Early in 2012, seeing the success of the companies and growing demand for Scott Archery’s products, The Outdoor Group, owner of bow manufacturer Elite Archery, completed its acquisition of Scott. A year later, Winner’s Choice Custom Bowstrings was added to the fold to bring together a conglomerate that reaches a range of archery shooting needs. Although the original brands remain after the mergers and acquisitions, and some of the existing manufacturing facilities continue production, the potential of the Scott facility would not be overlooked this time. While it continues to make parts for its releases, it has also been heavily involved in production of parts for both CBE and Winner’s Choice. And production and sales goals continue to shoot up at an extraordinary pace. Mr. Collins speaks highly of his current shopfloor crew, but in the case of the Swiss department, he specifically commends Lance Horn, the lead machinist on the Citizens. Yes, not only does the company now have more than one; it recently installed its eleventh, with a twelfth currently on order. So why the change of heart regarding the approach to Swiss? Mr. Collins has unleashed the machines’ milling capabilities and applied them to the extensive line of prismatic parts that the company produces. “In the past, we would blank parts off on the lathe, and then move them to the vertical,” he says. With a lot more setups and part handling than they wanted, the Swiss machining seemed to be slowing them down. But he has shown Lance Horn that there is a better way. “With Lance’s knowledge and, frankly, his willingness to try new things, we’re now able to do all of our jaws and heads complete on the Citizens.” And with a 12-foot bar loader on each machine, they run lights out, 24/7, providing parts 10 times faster than before. Scott Archery clearly has found ways to step up its game through improved Swiss machining operations. But surprisingly, better production advances are taking place elsewhere on the shop floor. In the milling department, along with its two older model Fadal machines, Scott Archery is now running four Haas VF-2SS VMCs, a VF-3SS VMC, and a Haas DT-1 vertical drill and tap center. While these machines make a few parts for Scott releases, most of their machining time is devoted to requirements of the other divisions of the company (such as a micro windage unit—a precision piece used for slight aiming adjustments on a CBE sight). Leading the way in the milling department is Robbie Walters. Like Mr. Horn, he’s young and open to new ideas. This approach has served him well as the department has incorporated automated clamping systems from PAWS Workholding (PAWS stands for pressure actuated workholding systems) as a method of increasing production to keep up with the growing demand. So far, this move has proven to be a wise choice. According to Vice President Eric Griggs, the systems have helped to decrease costs by at least 35 percent. “The fastest growing part of our business is the CBE target sights,” says Mr. Griggs, who is also a professional shooter. “All that equipment runs on the verticals, where the PAWS Workholding systems come into play. It has increased production and efficiency tremendously.” Mr. Collins adds that some parts are being produced 75 percent faster. The PAWS system is intended primarily to hold a series of small, round or multi-sided parts for secondary operations such as milling, drilling, tapping and slotting. Depending on the system selected, parts are held on their ID or OD or are clamped in vises with soft jaws. Creative approaches to workholding can substantially increase production rates. Here, three pallets are loaded onto a single VMC. The workholding system consists of a hydraulic base plate, a fixture plate, a hydraulic pump and a control valve. The fixture plate bolts to the hydraulic base plate and is interchangeable with other fixture plates set up for different parts, making for fast change-overs. As many as 80 points of clamping are available, every 2 inches on center, and the operator selects the points of clamping best suited to his or her needs depending on such considerations as part size, configuration and tool clearance. Parts can be hydraulically clamped by the inside or outside dimension and in a vertical or horizontal orientation. The workholding system, which consists of a hydraulic base plate, a fixture plate, a hydraulic pump and a control valve, is intended primarily to hold a series of small, round or multi-sided parts for secondary operations such as milling, drilling, tapping and slotting. The electric-hydraulic pump is the power supply to the system. It provides as much as 3,000 psi and is powered with standard shop air. With the standard package, multiple parts are loaded in and removed from the fixture mounted in the machine, which is a big improvement over loading/unloading one, two or several parts at a time. However, the system is also available with an optional accumulator, which enables it to remain hydraulically charged with the hoses disconnected. With the accumulator, the system can be loaded with parts to be machined and pressurized away from the machine, permitting a pallet-switching arrangement for more machine uptime. The fourth-axis trunnion-style fixture provides access to all sides of the part for multiple operations. It allowed Scott Archery to reduce operations, on this part from five to two. On the business side, bringing together a series of related products through acquisitions has allowed the company to broaden its reach to the market, but has also stepped up the demand for product. On the production side, the PAWS systems have played a major role in helping the company deliver on those demands that increased business has brought. 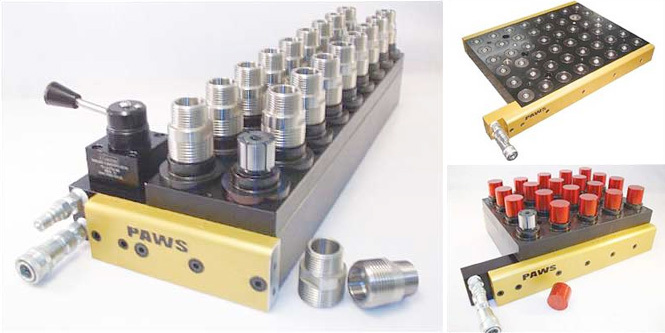 PAWS Workholding has developed a modular Hydraulic Clamping Multi-Vise System to use in production milling applications. The vise is designed to incorporate multiple-part workholding with fast, efficient clamping in order to maximize spindle cut time and density of parts in the milling work space. The system allows for machinable jaws to be interchangeable from part to part, giving users fast changeovers and minimal downtime, the company said. The interchangeable jaws are designed to allow for many different types of irregular shaped parts, accommodating very small parts as well as larger parts up to five inches in diameter. “Suitable for contract manufacturers or OEMs that perform CNC production milling, the system automates clamping on CNC mills, resulting in greatly reduced load and unload times,” said a company spokesperson. “The vise system incorporates the use of eight OK-VISE DK2-VTI-T clamps that are designed to produce downward clamping force to eliminate jaw lift. Clamp with adjustable and consistent pressure on every load with up to 3,500 lbs. of force per jaw. Options include machinable jaws in either steel or aluminum and an accumulator package for pallet switching applications. PAWS Workholding has introduced its new modular Hydraulic Clamping System. Suitable for contact manufacturers or OEMs who perform CNC production milling, the system automates clamping on CNC mills, resulting in reduced load and un-load times as well as minimizing idle spindle time, the company said. With clamping points available every two inches on center, the PAWS system allows for more density under the spindle on the fixture plate. This feature gives users the ability to decrease the total number of tool changes and load sequences required when running jobs, creating more efficiency and capacity, said PAWS. 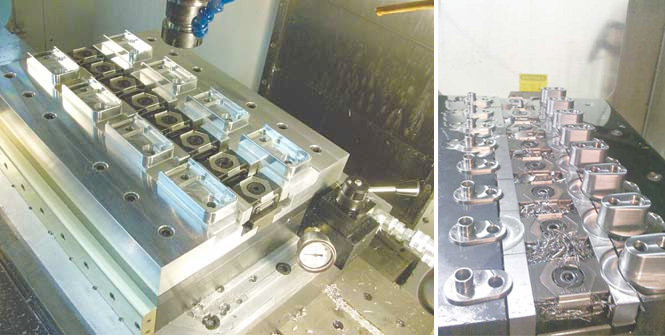 “For maximum flexibility, PAWS users can create modular fixture plates utilizing many of today’s standard clamps, such as Mitee-Bite Uniforce, OK-Vise Wedge, Pitbull, ID Collet, V-Block, Vise and many others,” said a company spokesperson. “The PAWS Hydraulic Base provides a grid map of clamping points to the fixture builder. Manufacturers can now utilize all the advantages of hydraulic clamping without the high cost of a dedicated system. Users can make one investment in the hydraulic base and create interchangeable fixture plates for each new job or part. PAWS also offers a line of standard ‘off-the-shelf’ ID collet and multi-vise fixture plates to help get jobs up and running quicker. Four standard hydraulic base sizes are available: 4″ x 19″ unit with 18 dual-acting pistons, 8″ x 10″ unit with 20 dual-acting pistons, 12″ x 16″ unit with 48 dual-acting pistons and a 16″ x 20″ unit with 80 dual-acting pistons. Other features of this system are a .230 piston stroke and an adjustable clamping force of up to 3,500 lbs. Options include a hydraulic pump, interface plates, standard multi-vise fixture plates, standard machinable ID collet fixtures plates, pressure sensors, hard plumbing of hydraulics and custom workholding solutions. Air-Way Manufacturing Company is an OEM specializing in producing a full line of hydraulic fittings and accessories for off-road construction, agriculture, material handling and defense. One of Air-Way’s strengths is its ability to design and build custom hydraulic fittings for its customers with quick turn around. Over the last couple of years Air-Way has had to explore ways of increasing the efficiency of its manufacturing operations. 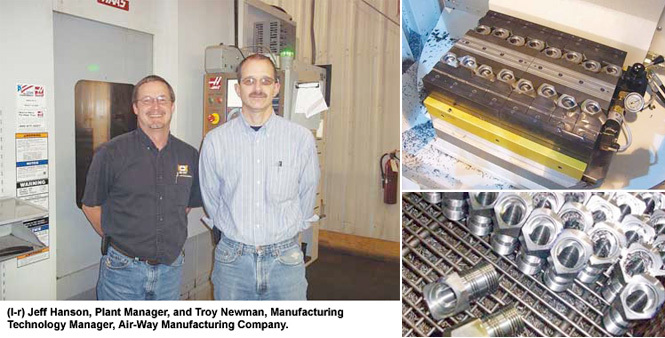 Troy Newman, Manufacturing Technology Manager, along with Jeff Hanson, Plant Manager, and J.C. Buettgen were put in charge of a project to move all of the company’s secondary operation machining from a total of 15 multi-spindle chucking machines onto newer, more efficient equipment. The previous machines had been performing secondary operations for over 125 different part numbers. The company wanted to accomplish several goals as a result of this transition: reduce setup time from the previous 8-10 hours per operation, reduce labor cost for both setup and production, establish the ability to run smaller lot sizes to minimize inventory (in the past, larger production runs were necessary to justify cost of the longer setups), reduce perishable custom tooling cost, eliminate the labor involved in subsequent de-burring operations and reduce maintenance cost. Air-Way had eight full-time employees in the secondary operations department plus two full-time maintenance persons. In looking at possible solutions for this transition, Air-Way narrowed its choice down to two options for secondary operations: a rotary turntable type of machine or a turntable CNC mill. After weighing the pros and cons of both systems, Air-Way chose the CNC mill. The company chose the CNC mill primarily because it could provide more flexibility in tooling and workholding options. Many similar parts meant CNC programs could be modified slightly from one part to the next. Another important reason was the possibility of much shorter setups and changeovers. Newman felt the company’s best chances of achieving its goals were with the CNC machine. Another reason was the ability to use more off-the-shelf tooling versus custom tooling with a rotary turntable type of system. Initially, Air-Way was only looking at one turntable CNC mill to start transitioning all of the secondary work. As it turns out, the company purchased two new turntable mills to make sure they had enough capacity and to make the transition happen more quickly. “I was very thankful we decided on two machines, because they have been running two shifts solid for two straight years with very little down time,” said Newman. Air-Way decided there were several important aspects of the workholding that were critical to accomplishing their goals. One, the two CNC mills had to accommodate the production of approximately 125 different part numbers, so the fixturing had to be extremely flexible and modular. Setups and changeovers had to be fast. Secondly, it had to be automated with either hydraulics or pneumatics because Air-Way was going to require one operator to run both machines. Loading and unloading had to be fast and easy so the operator could keep up with the machines. Newman quickly eliminated standard hand clamping options from the workholding equation because, as he said, “We didn’t want operators cranking handles 1,000 times a day.” Operator fatigue and efficiency were major concerns for Air-Way. Thirdly, because volumes where increasing on many of the parts, Air-Way had to maximize the number of parts under the spindle in one machine cycle. 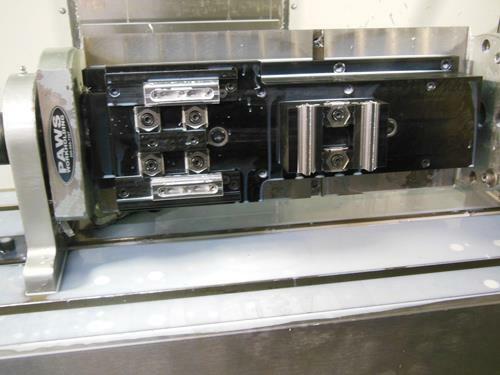 They had to harness the power of multiple-part workholding to gain the efficiency needed. More parts under the spindle meant fewer tool changes and operator load sequences, both major factors in maximizing productivity. Air-Way narrowed its workholding down to two choices: a dedicated, custom designed hydraulic system and a modular hydraulic system by PAWS Workholding. Once the engineering started taking place to decide how to fixture and locate all of the parts, it was easy for Air-Way to decide on the system offered by PAWS Workholding. The other hydraulic system being considered did not allow as much flexibility in changing over from one part to the next and didn’t allow for the same density under the spindle. PAWS offered a hydraulic base unit that allows for interchangeable components on the fixture plate to make changeovers truly modular. 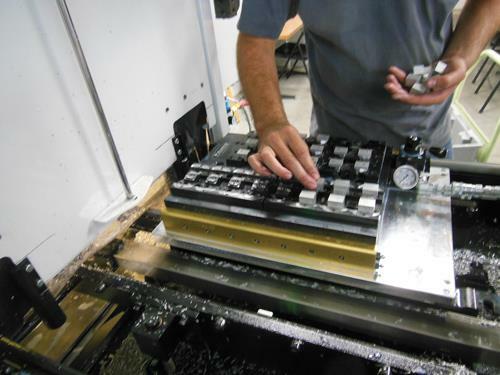 The system consists of the PAWS Hydraulic base and a fixture plate with sixteen individual 2″ machinable vise jaws. The Sixteen Station Multi-Vise is a standard fixture plate option offered by PAWS Workholding. Air-Way, with the help of PAWS Workholding, engineered removable fixed jaws on the fixture plates for all of the variations of parts the company needed to manufacture. Air-Way ended up with about two dozen sets of jaws that could accommodate all of the various stock sizes and blanks they needed to run. The jaws can be switched in minutes, so changing from one part to the next now takes Air-Way 20 minutes. Air-Way is able to get as many as 16 parts under the spindle on one pallet with the PAWS System. Most of the machining during the secondary operations is drilling and circular interpolating holes. Another major benefit that has come unexpectedly to Air-way is a huge reduction in scrap rates during setups. This benefit was not listed in their primary goals and has been a pleasant surprise to the transition team. The fixturing was designed to be modular and to locate with repeatability. Now, first pieces come off the machine in print with very little variance from one run to the next. Air-Way has now been using the four hydraulic base systems from PAWS (two on each machine) for two years with the modular top plates and realizing all of the company’s stated objectives and goals in spades. All of the secondary operations are now being completed with two machine operators (one on first shift, one on the second) versus eight operators in the past. Setups and changeovers have gone from eight hours to 20 minutes. Air-Way can run any desired lot quantity because the changeovers are so much quicker. 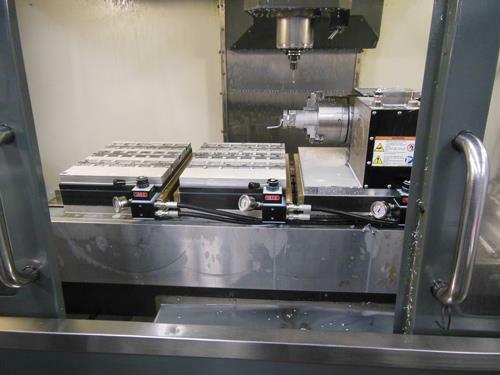 Much of the tooling used on the CNC mills is standard, off-the-shelf endmills and inserts. By using automated clamping, operator fatigue is not an issue. Air-Way no longer has the extra labor in de-burring parts because of the ability to circular interpolate holes with an endmill on the CNC mill, leaving no burrs. The maintenance cost on the two CNC mills is greatly reduced compared to maintaining 15 multi-spindle machines. Newman also incorporated one other useful advantage in using a hydraulic clamping system. Pressure sensors were installed into each machine to check the clamping pressure before each operation. If the pressure is not at the appropriate level, the CNC machine will not cycle start. Newman said, “We have eliminated operator mis-loads completely, there is no more forgetting to clamp parts. Anytime human error can be eliminated from the process, it’s a good thing.” Air-Way also checks to confirm that the right pallet is loaded into the machine to run the right program; if not, the machine will not cycle start. Air-Way’s transition of its secondary operations from the multi-spindle machines onto the CNC mills using PAWS Workholding has been an amazing success, the company said. The transition took about six months, and there were many long days for Newman and the transition team. The return on investment took about a year, but Air-Way is now reaping the rewards of all of its efforts.